Ancient Keleni had long ago mastered many of the arts of psionic resonance, which allowed the wielder of a weapon or item to “attune” his psychic powers to the item. This might allow him to power the item or imbue it with an element of his own power. They called this technology “resonance,” and a resonant item has an aura, invisible to mundane senses, flowing around it. A resonance staff is the most common application of this technology. It seems a standard staff, though it tends to be made either of a nano-tube cellulose that is “grown” for the purpose of forming a resonance staff, or made of a metallic nanocomposite. All forms have an embedded eloi fragment or a pseudo-fragment that can attune the weapon with the user. Once so attuned, the staff acts as an extension of the wielder: what the staff touches (or strikes) counts as “touched” by the user for the purpose of psionic powers. This has numerous combat applications: see the Resonance Charge ability below. Second, the aura around the weapon can be “hardened” to dissipate destructive forces. This means that energy weapons, such as force swords, can be parried without damaging the weapon, similar to the effect a neurolash-field can have on a force sword. See Resonance-Field Parry below. Treat a Resonance Staff as a Quarterstaff, with a CF of +9 and an additional flat cost of $500 (thus a resonance quarterstaff costs $600). Add bonus damage to all strikes equal to the wielder’s best psionic talent. Where Keleni resonant weaponry had originally been for self-defense, with the Eldothic invasion of their homeworld, some Keleni repurposed the technology for greater lethality, so that they could murder their enemies. They created the first “psi-blades,” a technology described on page 39 of Pyramid #3/51 “Tech and Toys,” that allowed them to manifest their psychic energy as a purely destructive force. Treat a Psi-Sword as described in the article above (with the same weight, cost, reach and other traits as a force sword) except that its damage is equal to +1d for every 10 points of appropriate psionic ability, with bonus damage equal the wielder’s talent, and with an armor divisor of 5 or the armor divisor noted in the appropriate psychic ability whichever is better. Keleni traditionally created smaller weapons, such as the Psi-Blade, which is more comparable to a long knife than a sword. Treat Psi-Blades as using the same rules as Psi-Swords (but with the same weight, cost, reach and other traits as a force blade, from UT page 166), but its damage is +1d for every 12.5 points of appropriate psionic ability (or +2d for every 25 points) and bonus damage equal to the wielder’s talent. 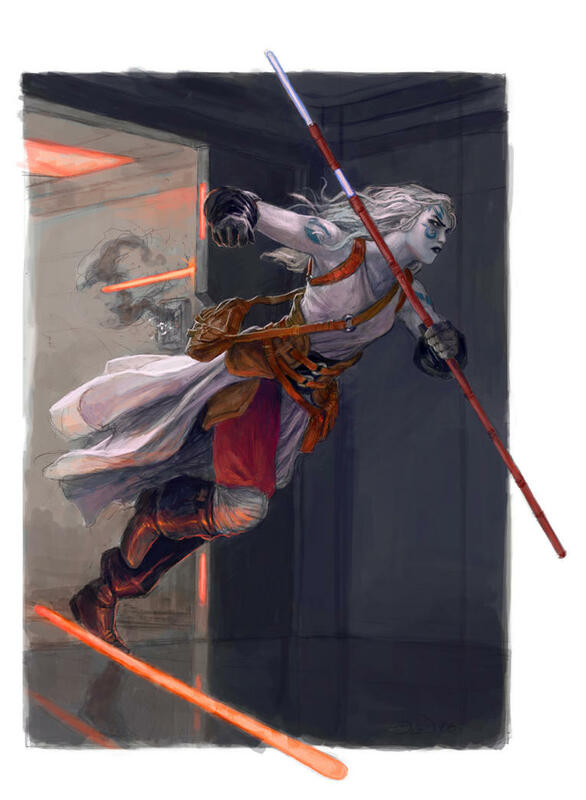 Sasona Smalle, or Keleni Stick-Fighting, uses an ancient Keleni weapon, one that predates the creation of the psi-blade: the Resonance Staff. A resonance staff extends the aura of the wielder, and allows him to make “skin contact” with another by touching his staff to them. The Keleni combine the resonance staff with Keleni Stick Fighting to perfectly read their opponent and anticipate what they’ll do next, and then to unleash not just blows, but mental blows on their opponents. Elderly and frail Keleni masters might stagger and defeat several fully armored opponents, leading others to believe that he has great strength, but they miss the telepathic battle that takes place at the end of his staff. Keleni “Stick Fighting” is somewhat deceptive, as the technique makes use of aggressive unarmed combat techniques as well. A skilled master of Sasona Samalle can cripple an opponent with high precision strikes that border on the supernatural. Sasona Samalle is a lens on Ishin-Denshin from Christopher Rice’s Mind and Body in Pyramid #3/69: Psionics II. First Principle: Anālmañen (Connection): Take a Concentrate Maneuver and initiate the Independent technique of Telerecieve by making a quick contest between Telerecieve-7 and your opponent’s Will. If successful, you may read your opponent’s mind for the rest of the fight without taking any further actions, and you may ignore up to -1 in penalties to your defenses from deceptive attacks or feints. You may defend normally. Second Principle: Anpēsse (Distraction): Make a Defensive Feint (Telesend) maneuver (-3); Roll a quick contest of Telesend against the better of your opponent’s IQ-based best weapon skill or Tactics. Your opponent defends against your next attack at a penalty equal to your margin of success. You parry at +1. Third Principle: Jawēha (Deception) (Karate): Make a rapid strike Feint (Telesend) (-6) followed by a Rapid Strike (-6) Sweep with your staff (-3). Your opponent defends at a penalty equal to your margin of success on the feint. If you hit, roll Sweep vs the highest of his ST, DX, Acrobatics of best grappling skill. Success knocks him prone. You defend normally. Fourth Principle: Jatarōñ (Anticipation): After making an Aggressive Parry, make a Karate Counter Attack (-5) against your opponent’s torso. Roll Karate-5. Your opponent defends at -2. Deal thr-1 (+karate bonus) damage. You defend normally. Setup: You made a successful aggressive parry. Fifth Principle: Anhūwīke (Disruption): Make a Deceptive (-2) Committed (+2) attack with your staff against the opponent’s torso using a Resonance Charge (-6) Mental Blow with Lasting Blow (-8). Your opponent defends at -2. If you hit, (assuming you have Mental Blow of at least level 2), in addition to inflict damage, roll a Quick Contest of Mental Blow Skill (-10) vs your opponent’s Will. On a success, your opponent is Stunned for 10 seconds and can only roll Will every 10 seconds to recover. Sixth Principle: Jaxēta (Strike): Make a Telegraphic (+4) All-Out (Strong) attack against the opponent’s neck (-5) with an exotic hand strike (-1). Your opponent defends at +2. If you succeed, deal thr-1 (+karate bonuses) cr damage to the neck; damage is multiplied by 1.5. If your opponent has any rigid DR on the neck, you may Hurt Yourself (B379). Setup: Your opponent is stunned and not wearing any rigid armor on the neck. The Forbidden Principle: Anλāta (Murder): Make a Deceptive (-2) Committed (+2) attack with your staff against the opponent’s torso using a Resonance Charge (-6) Mental Stab. Your opponent defends at -2. If you hit, (assuming you have Mental Blow of at least level 2), in addition to inflict damage, roll a Quick Contest of Mental Stab Skill (-6) vs your opponent’s Will. On a success, inflict one point of damage per margin of success (a maximum of 10) that completely bypasses DR.
Janura has an old, and controversial, history among the Keleni. When the Eldothic Empire first conquered their worlds and began mass exterminations, desecrations and dragging Keleni children off to their laboratories, certain Keleni violated sacred principles against violence and took the resonance technology of the resonance staff and forged the first psi-blades. Their art has endured throughout time; whenever Keleni face insurmountable suffering and injustice, they turn to the psi-blade to solve the problem. The elders of the Keleni hate the style and everything it stands for, believing it brings more suffering than it eases, and that the Keleni should find a way to live in harmony with others. The weapon of Janura, or Keleni Blade Fighting is not a force sword, but a psi-sword with a small, knife-like blade, the jeste. Keleni Assassins get in close to their opponents through stealth (or sheer, brazen fanaticism) and then grapple their victim and brutally drive the jeste directly into their target’s heart or other vital parts. The style focuses on finding one’s opponents, approaching undetected and then, once the fight commences, controlling the fight through grappling, throws and sweeps to bring the target down to where he can gain the upperhand and bring his psi-blade to bear. The art is easily learned, and in dark times, when the Keleni suffer, the Path of Justice has many followers, and they like to use those numbers, often coordinating telepathically to strike all at the same time. Masters of Keleni assassination techniques can fade from the mind’s eye, find their target no matter how he hides, get into any place undetected and destroy his opponent. The Sutra of Mercy: While hidden and approaching your opponent from behind, make a Choke Hold (Judo-2) roll. Your opponent can only make a parry with a grappling roll at -2. If successful, you have gained a chokehold. You may defend normally. The Sutra of Unity: While synced up with Teamwork, make a Feint. Roll Feint (Force Sword) against the best of your opponent’s DX-based combat skills or his tactics; on a success, your opponent’s defense against your next attack is penalized by your margin of victory. You may pass this to one of your allies who is synced with you. The Sutra of Humility: After a successful Judo Parry or after grappling your foe, make a Sacrifice Throw. Succeed or fail, you end up prone face down next to or atop your opponent. Your opponent blocks and dodges at -1 (-2 if grappled) and parries at -3. If you succeed, your opponent is prone and you maintain your grapple. You may not defend. The Sutra of Sacrifice: Make an All-Out Attack (Double). You may move up to half of your move, then make grapple for your opponent’s torso with Judo. Your opponent defends normally. Then make a Force Sword Attack to the vitals (-3). Your opponent defends at -2 (from being grappled). On a success, deal 2x damage. You may not defend. The Sutra of Heaven: While above your opponent, drop to attack them with your force sword in reversed grip. Make an All Out Attack (Determined +4) to the Skull (-7) with Force Sword with Attack from Above (-2). Your opponent defends normally (though see Attack from Above B402 for additional stealth rules). If you hit, deal 4x normal damage. You may not defend. Prerequisite: A Melee Skill; May not exceed default skill. A resonance field, like a Neurolash field, has the capacity to form a thin barrier between staff and force sword, allowing it to parry and be parried by a force sword without being destroyed. A resonance weapon carries the aura of the wielder with it. What it touches, the wielder touches. This allows the wielder to “transmit” psionic effects that require contact. More than that, the wielder can “charge” the resonance field with such an effect, allowing him to release it simultaneously with an attack: this is a very special case of “rapid strike” and the difficulty of a resonance charge is halved if the character is a Weapon Master or has Trained by a Master.